Here’s my approach for getting Optiboot from current Arduino 1.0 onto old boards. I’m stepping forward with this despite my highly amateurish understanding of the Arduino system, so please cut me some slack on this one. Your corrections in the comment section are highly appreciated. My only “true” Optiboot board, an Arduino Uno, is buried in my son’s room. What I do have are Arduino Duemilanoves and Pro Minis (ATmega 328, 16MHz, 5V), which are perfectly good for the exact same tasks as the Uno. I want them to be upgraded to Optiboot, because instant start-up makes a lot of sense in battery-powered applications. 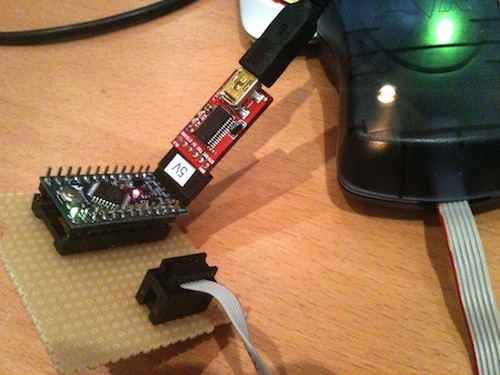 I also have an Atmel AVRISP mkII, which is the proper tool for programming the bootloader. Also at hand is an adapter board for the Pro Mini, to break out the proper pins for the ISP. A Duemilanove during the bootloader upgrade. A Pro Mini during the bootloader upgrade. I copy these blocks and change the respective entries to match what’s already there for native Optiboot boards. 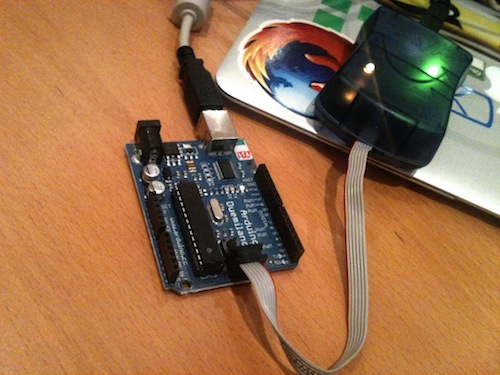 Boards.txt lists the Arduino Ethernet, which is an Optiboot board and needs to be programmed using an FTDI breakout just like the Pro Mini. Hence, I assume that the serial chipset makes no difference for Optiboot settings. Note how the board token at the beginning of the line has been extended with an “o” on the entire group of lines. Also note how I have not modified the maximum sketch size. I would expect that this can be pushed up towards the limit that is listed in the Arduino Uno’s section. I restart Arduino, select the respective board tagged [Optiboot] from the tools menu. I burn the bootloader and I’m done. – Basic example blink on Pin13: Works. – Analog example fade on PWM 9: Works. Have a lot of fun and let me know how things worked out for you. You are a diamond geezer. Thanks. I got an pre-programmed 328 with Optiboot but needed to run it on a Duemilanove. I was not aware that Optiboot is supported in 1.0. I am still using 022 and of course I was having problems. I cut and pasted your settings into boards.txt and voila! No more stk500_recv error. i *think* you can safely also change the max upload size — to match the UNO — the optiboot bootloader is smaller than the standard loader for duemilanove.